It is custom in the Catholic Church to recall the ministry of past popes and to pray for them on the anniversary of their death. The Church sets aside special Mass prayers for the occasion. We do the same for each and every person who dies but the remembrance of a pope’s death has universal importance given his place in history and the theological implications of his ministry as the Vicar of Christ. God our Father, you reward all who believe in you. 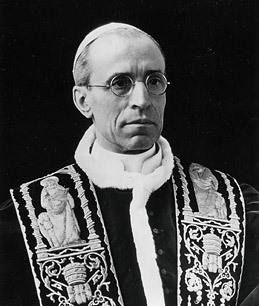 May Your servant, Pius XII, our Pope, vicar of Peter, and shepherd of Your Church, who faithfully administered the mysteries of Your forgiveness and love on earth, rejoice with You for ever in heaven. More on Pope Pius XII may be found here and here. Pray for his beatification.